Long time readers of this blog may remember my first time caving in Kuching, Malaysia a few years ago. 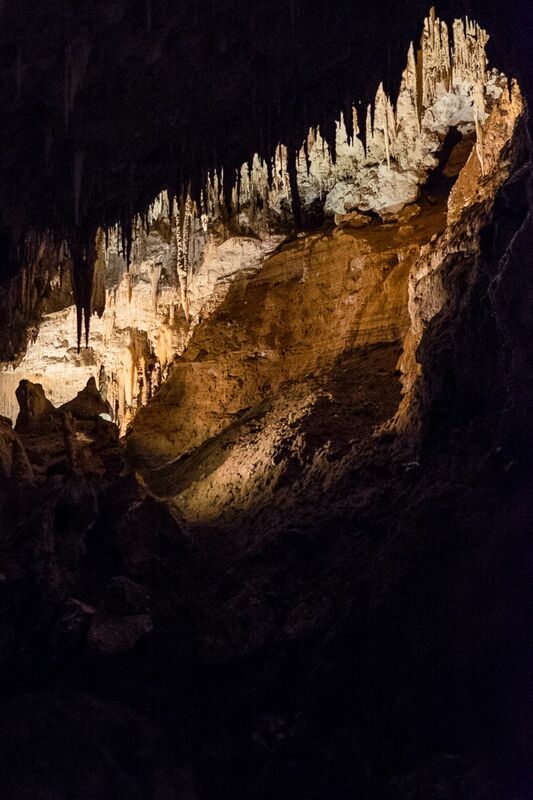 The view inside Fairy Cave was spectacular and surreal, but my strongest memories from the experience are of the smells of rust and the goop from railings slippery with mysterious cave drippings and bat poo. That, and the never-ending stairs. Caving tends to be a good measure of one’s fitness, including the state of one’s knees. On our recent trip to the Margaret River region, we had the opportunity to visit Lake Cave, so named for the permanent lake within the cave. 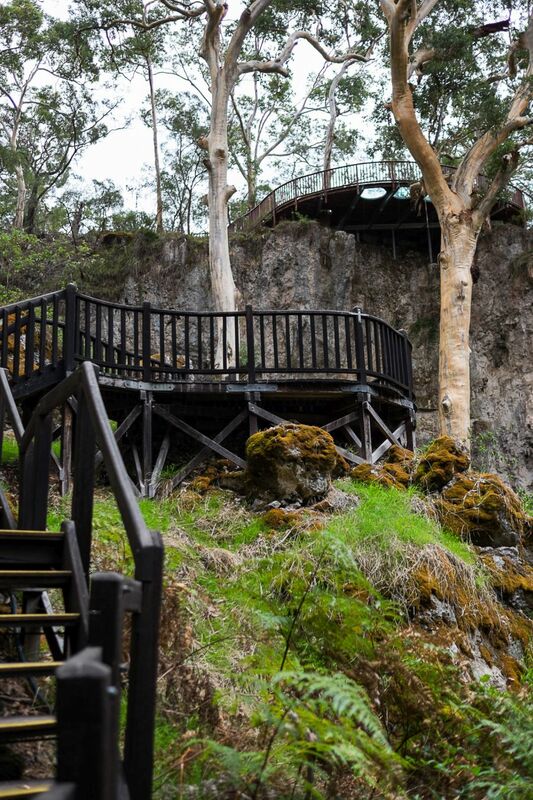 We admired the view from the Lake Cave Events Deck, a unique venue for events/functions of up to 150 people, built from local timber, with special glass portholes that provide a view down into the doline, a large crater in the earth’s surface which we’d access via a 350-step staircase to get to Lake Cave. We have to go down THESE stairs?! 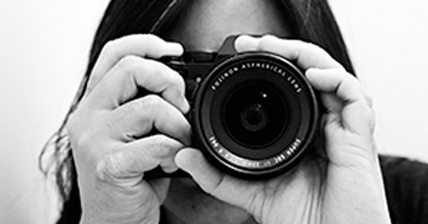 Uhuh, yes we did, crouching almost crab-like – not easy with two cameras! Our guide Georgia met us halfway down and led us into Lake Cave. She provided very informative commentary, touching on the history, geology and ecology of the cave, and pointed out its unique formations, including the spectacular 5-tonne ‘Suspended Table’, that appears to hover mid-air over the lake. Throughout the hour-long tour, she warned us of any potential hazards – the parts of the path with a handrail on one side and water on the other; slippery sections where we stepped with particular care; and low points where ducking was necessary. I wanted to be as unencumbered as possible and left my bag in the car. I was thankful I’d done so – the extra weight and bulk of a bag would’ve been a hindrance, especially going up and down the steps. I carried my two cameras on their straps, with lens hoods on for extra protection. I took my images inside the cave without flash. 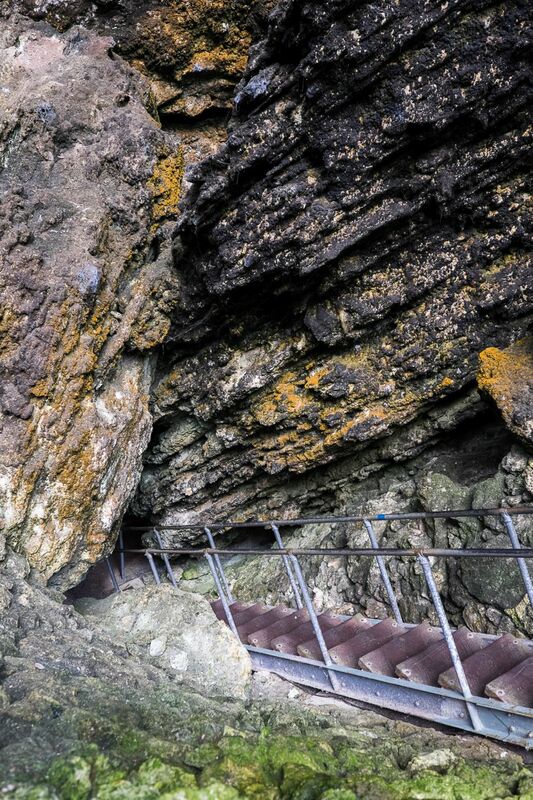 It’s not a very big cave, but its depth of 62 metres makes it the deepest tourist cave in the South West. The limestone formations are beautiful, like something out of a lost world. 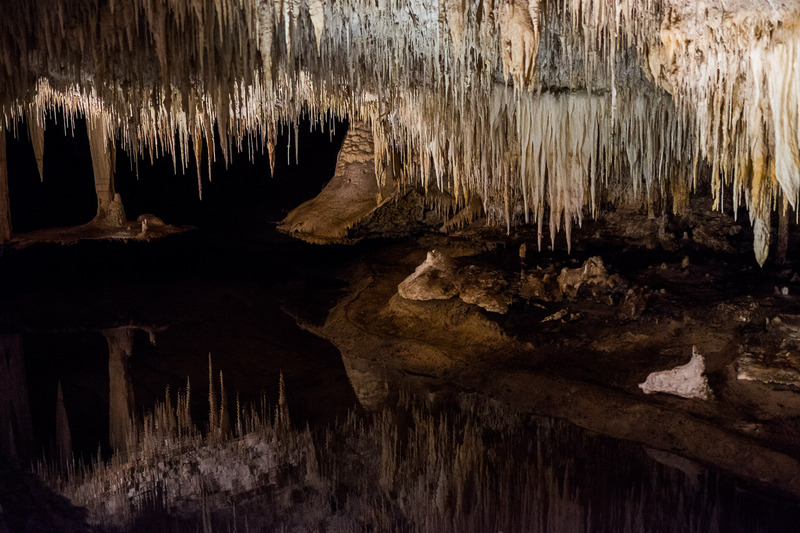 The reflective lake is dark and eerily still most of the time, the soundtrack of the cave coming from the echo of water dripping from stalactites. If you’re very unfit or have mobility issues, you may want to give Lake Cave a miss because of the stairs. 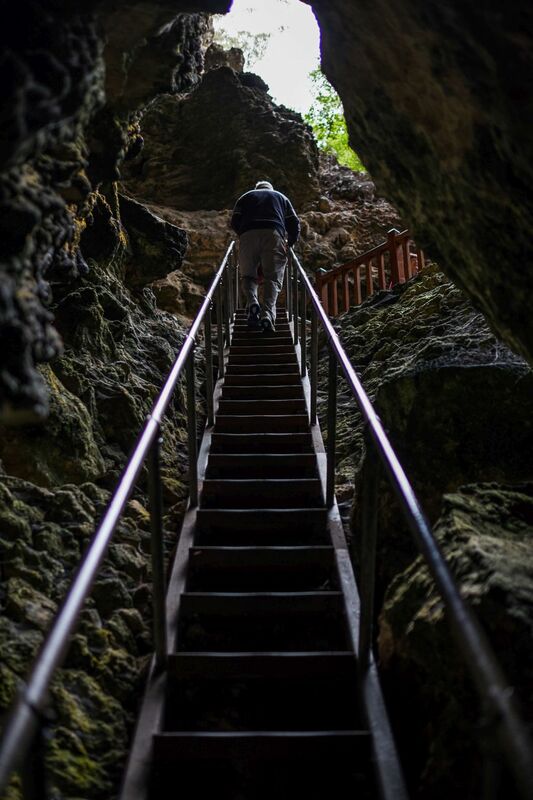 I mentioned it’s 350 steps to get down into the cave; there’s no shortcut, so it’s the same 350 steps to get back up again. Once inside though, the lit boardwalk makes getting through the cave reasonably easy. Would this be a suitable activity for kids? 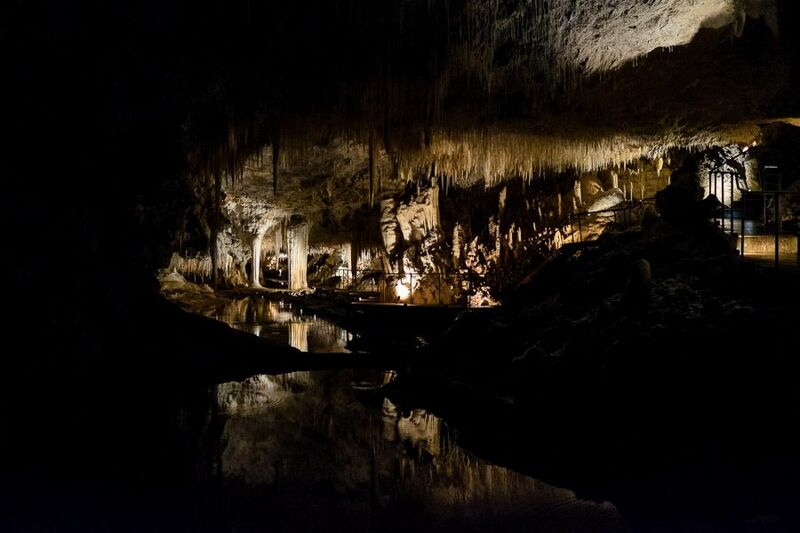 Our guide told us a lot of families with children do visit Lake Cave. 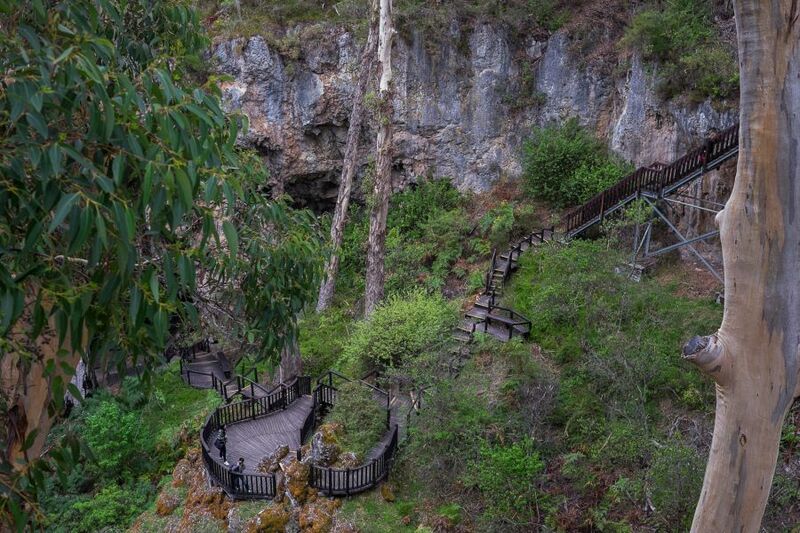 I think well behaved kids who can be trusted to stay with the group, pay attention and follow instructions will be fine to visit Lake Cave, but the sheer number of steps may be too tiring for very young children. So unfit! Had to stop for a rest. You can make your way back up the stairs at your own pace, and stop for a rest if you need to. You can see the portholes in the Lake Cave Events Deck near the top of this picture. Lake Cave Refreshments are available in the Lake Cave Tearooms (left). Enter the building on the right for the souvenir shop, an interpretive centre that includes a life-like replica of a cave, ticket sales and entrance to Lake Cave. 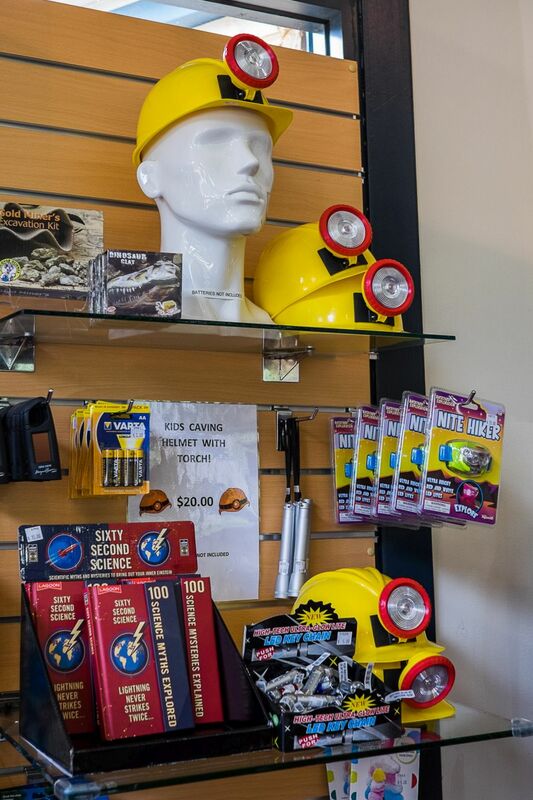 I totally should’ve bought one of these caving helmets…though ‘one size fits all’ hats and helmets generally aren’t big enough for my apparently bigger than average head. 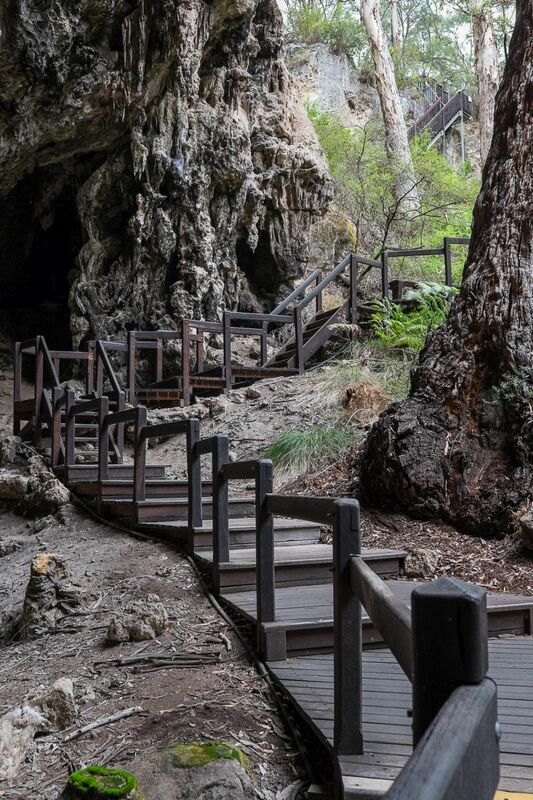 There are over 100 caves in the Margaret River region located along the Leeuwin-Naturalist Ridge. 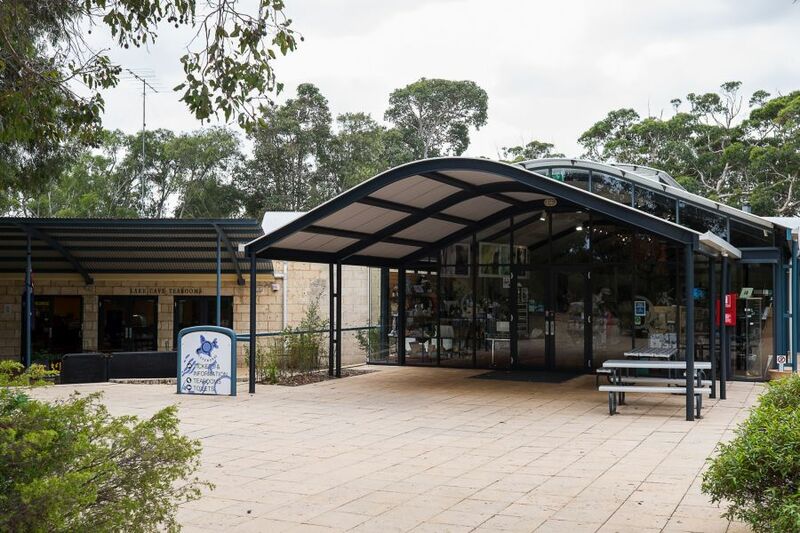 Lake, Jewel, Mammoth and Moondyne Caves are open to visitors, offer guided tours, and are managed by the Augusta Margaret River Tourism Association. Quite aptly, the caves are all located along Caves Road. Have you been caving? Which cave(s) have you been to? Adult: $22.00, Child (4 to 16 years): $10.00. Family pass and pensioner concession are available. 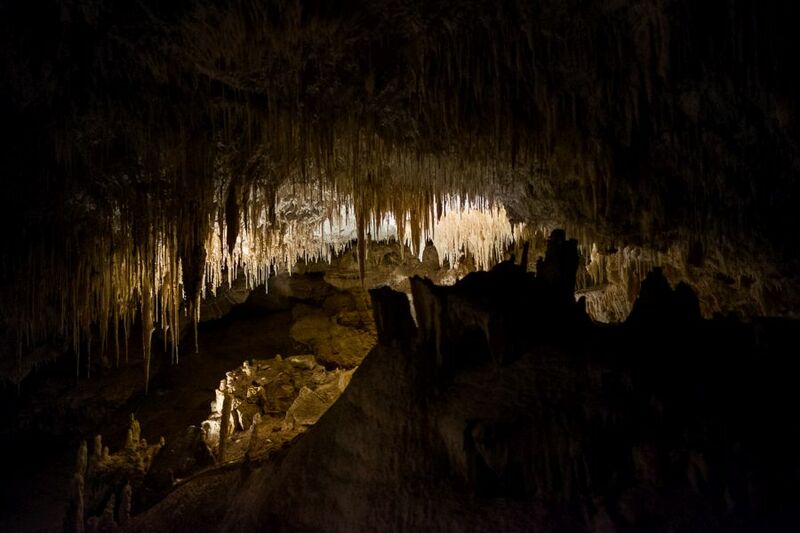 You can also buy a Grand Tour pass to see three caves (Lake, Jewel and Mammoth) or an Ultimate Pass to see the three caves plus Cape Leeuwin Lighthouse – see ticket prices and tour times and find out more about caves in Margaret River and Augusta. 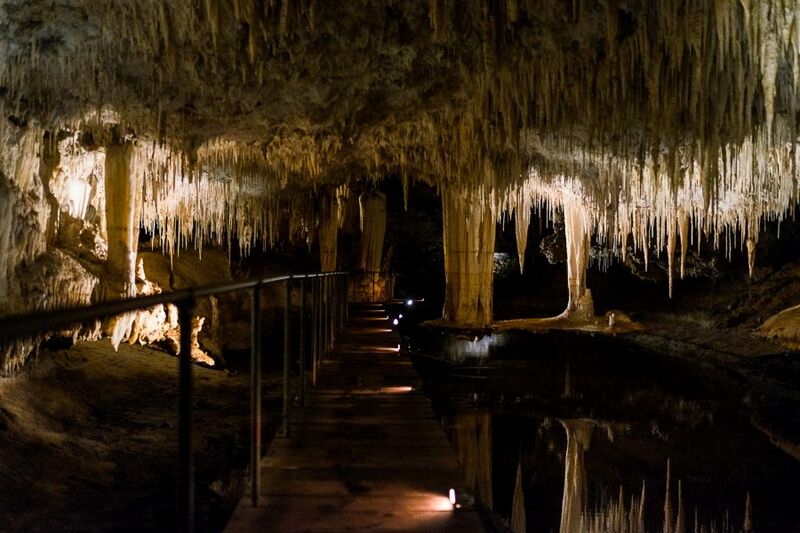 TFP and Jac experienced Lake Cave compliments of CaveWorks and the Augusta Margaret River Tourism Association. Given how much we ate on this trip, this was an excellent way to work some of it off. After all, our next stop was lunch!